Firefighters in Paris were battling a huge blaze at Notre Dame cathedral on Monday evening. 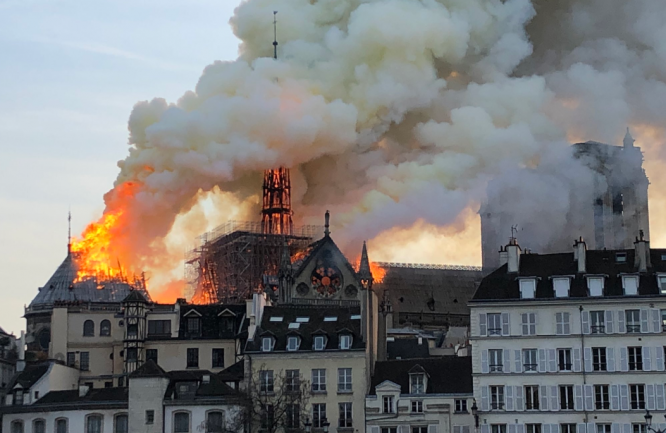 Images on social media showing the roof and spire of the 856-year-old cathedral on Île de la Cité engulfed in flames. The 300ft spire and part of the roof of the building have collapsed. The alarm was raised at about 6.30pm on Monday, and the cathedral was quickly evacuated. A major operation was under way, the fire department said, while a spokesman for the Mayor's office said on Twitter that the area had also been cleared. Mayor Anne Hidalgo described the blaze as a "terrible fire" and urged people at the scene to respect cordons set up by fire crews in order to ensure that they remain safe. The fire prompted President Emmanuel Macron to cancel a major address to the nation on Monday evening in which he was expected to outline the government's response to the recent grand debat. Notre Dame is one of Paris' most popular attractions, drawing an estimated 13 million visitors a year. The cause of the fire was not immediately clear, but officials have said that it could be linked to renovation work. Several statues had been lifted by crane from the spire last week.